When he learnt that his mother was ill & bed ridden Adi Sankara reached Kalady.The end time came .He prayed to Hari to bless her with moksha. He has come there leaving his disciples , his relatives & Nambudiri bhramins opposed him as a sanyasi should not perform then the last ritual .As he could not take her to the burning ghat, he took her to the corner place in the backyard of his house. He placed plantain stems covering her body & lit the fire by his yoga power as they refused to give him fire. Sankara proceeded to Kamarup the present Guwahati in Assam. There he defeated the famous shakta commentator Abinava Gupta.He later went to Joshi, built a mutt at Joshi & temple at Badri.He later reached Kedarnath ,higher up in Himalayas.He became one with the Linga in 820 A.D in his 32nd year.We should always remember him for his hard work in reviving Hinduism by establishing Advaita philosophy.At his period lot of other religious faiths were threatening the very existence of Hindu religion.He preached the glory of veda Shastras & convniced the people & many ruling kings to follow our mother religion. 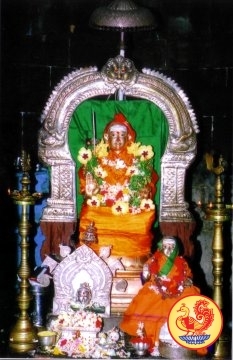 Bhaja Govindam,Viveka chudamani,Soundarya lahari & many more are his master pieces.He lived a very simple life & followed what he preached.Photo below the shrine of Adi Shankara at Kalady(photo courtesy- Sringeri mutt).Bottom second photo - right side Badrinath temple - Badri Narayanan.Left side Kedarnath temple built by Sri .Adi Shankara -one among 12 jyothir lingas. (photo courtesy - temple committee of Badrinath & Kedarnath).You can see the Big bull - Sri.Nandhigeshwar in fron t of Kedharnath temple.It is said that Pandavas visited this place & worshiped Shiva here after the end of the great war.